On the second Thursday of each month the Greater Sandpoint Chamber of Commerce hosts a General Membership Luncheon, also referred to as a GML. Members are welcome to take advantage of the following sponsorship opportunities at these luncheons. 5-10 minute presentation about organization. Introduction of organization during luncheon host welcome. Luncheon Sponsor announcement in Chamber weekly newsletter. Promotional materials and table displays. 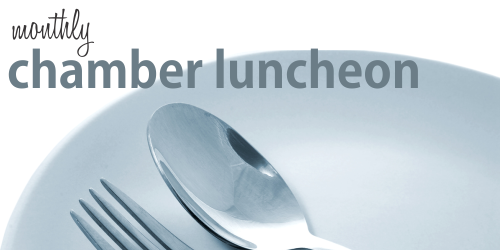 Availability of Luncheon Sponsorship is subject to the approval of the Chamber Communications Manager. Luncheon Sponsor is responsible for the set up and take down of their vendor booth, as well as the removal of all promotional materials and table displays at the end of the luncheon. Any items that are not removed will be recycled, not returned. 5 minute presentation about organization. Availability of Table Sponsorship is subject to the approval of the Chamber Communications Manager. Table Sponsor is responsible for the removal of all promotional materials and table displays at the end of the luncheon. Any items that are not removed will be recycled, not returned. To inquire about the availability of Chamber General Membership Luncheon opportunities, please click here.